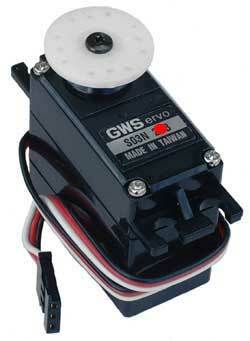 Servos are DC motors with built in gearing and feedback control loop circuitry. And no motor drivers required. They are extremely popular with robot, RC plane, and RC boat builders. Most servo motors can rotate about 90 to 180 degrees. Some rotate through a full 360 degrees or more. However, servos are unable to continually rotate, meaning they can't be used for driving wheels, unless they are modified (how to modify), but their precision positioning makes them ideal for robot legs and arms, rack and pinion steering, and sensor scanners to name a few. Since servos are fully self contained, the velocity and angle control loops are very easy to impliment, while prices remain very affordable. To use a servo, simply connect the black wire to ground, the red to a 4.8-6V source, and the yellow/white wire to a signal generator (such as from your microcontroller). Vary the square wave pulse width from 1-2 ms and your servo is now position/velocity controlled. The PCA is a special modules in Philips P89V51RD2 which includes a special 16-bit Timer that has five 16-bit capture/compare modules associated with it. Each of the modules can be programmed to operate in one of four modes: rising and/or falling edge capture, software timer, high-speed output, or pulse width modulator. Each module has a pin associated with it in port 1. Module 0 is connected to P1.3 (CEX0), module 1 to P1.4 (CEX1), etc. Registers CH and CL contain current value of the free running up counting 16-bit PCA timer. The PCA timer is a common time base for all five modules and can be programmed to run at: 1/6 the oscillator frequency, 1/2 the oscillator frequency, the Timer 0 overflow, or the input on the ECI pin (P1.2). The timer count source is determined from the CPS1 and CPS0 bits in the CMOD SFR. In the CMOD SFR there are three additional bits associated with the PCA. They are CIDL which allows the PCA to stop during idle mode, WDTE which enables or disables the Watchdog function on module 4, and ECF which when set causes an interrupt and the PCA overflow flag CF (in the CCON SFR) to be set when the PCA timer overflows. The Watchdog timer function is implemented in module 4 of PCA. 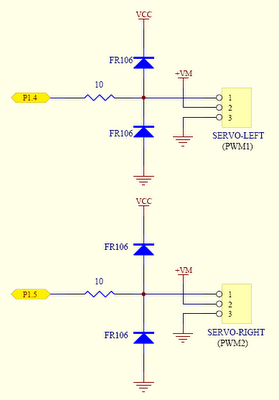 Here, we are interested only PWM mode. All of the PCA modules can be used as PWM outputs. Output frequency depends on the source for the PCA timer. All of the modules will have the same frequency of output because they all share one and only PCA timer. The duty cycle of each module is independently variable using the module's capture register CCAPnL.When the value of the PCA CL SFR is less than the value in the module's CCAPnL SFR the output will be low, when it is equal to or greater than the output will be high. When CL overflows from FF to 00, CCAPnL is reloaded with the value in CCAPnH. this allows updating the PWM without glitches. The PWM and ECOM bits in the module's CCAPMn register must be set to enable the PWM mode. For more details see P89V51RD2 datasheet. - What is a Servo? That is a nice and informative post on Servo Motors. can u explain to me??? HEY YOU HAVE ATTACHED A RESISTANCE AT THE SIGNAL WIRE OF SERVO MOTOR..WHAT IS THE VALUE OF THAT RESISTANCE..?PLEASE HELP ME..!